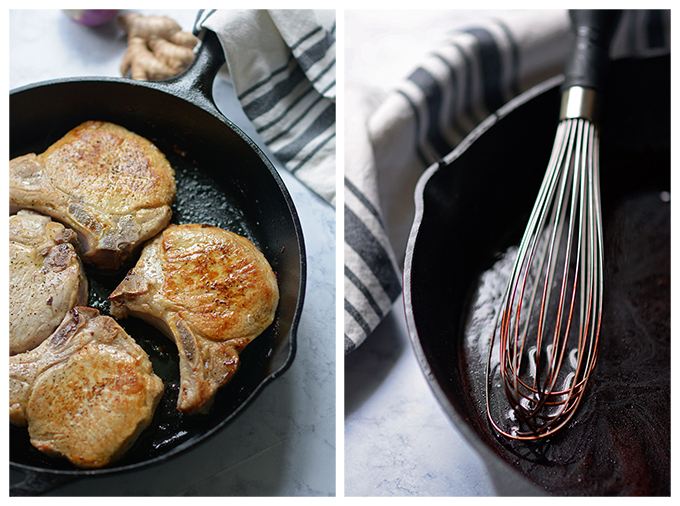 Skillet Pork Chops with Blackberry Glaze – Do you tend to shy away from blackberries due to their texture? Shy away no more! 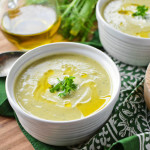 This sweet & savory recipe captures all the wonderful flavor with no pesky seeds! Earlier in the season I was visiting my in-laws and my mother-in-law kept going on and on about how she loves to eat blackberries. It then occurred to me that I don’t actually have any blackberry recipes up on Simple Seasonal. So, I guess you can say that today’s recipe is inspired by her! 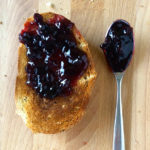 I’ve been writing Simple Seasonal since 2014, so I’m a bit appalled and embarrassed that this blog, which focuses on seasonal, American cooking, has no blackberry recipes on it. Truth be told, I love the flavor of blackberries, but their texture is not my favorite of all the berries. That said, I set about developing a recipe with that in mind. 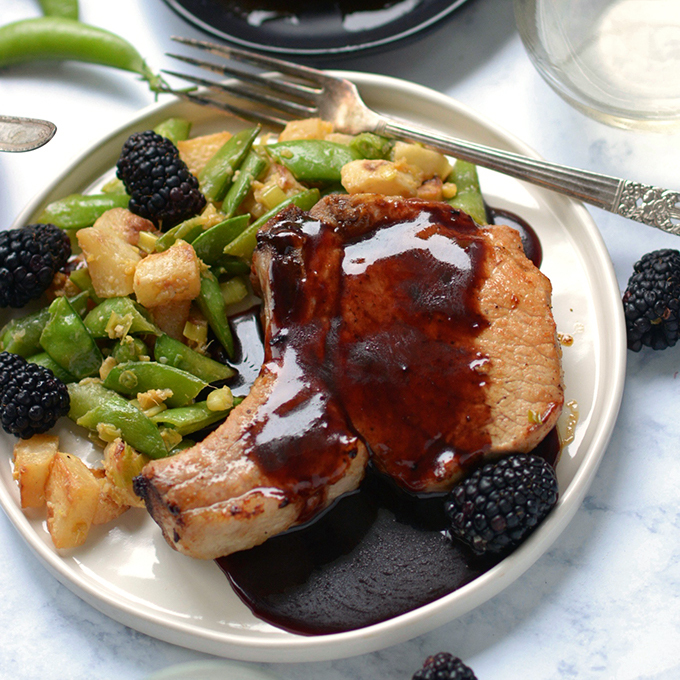 Today’s recipe features blackberries in a smooth sauce, so the texture problem is solved! 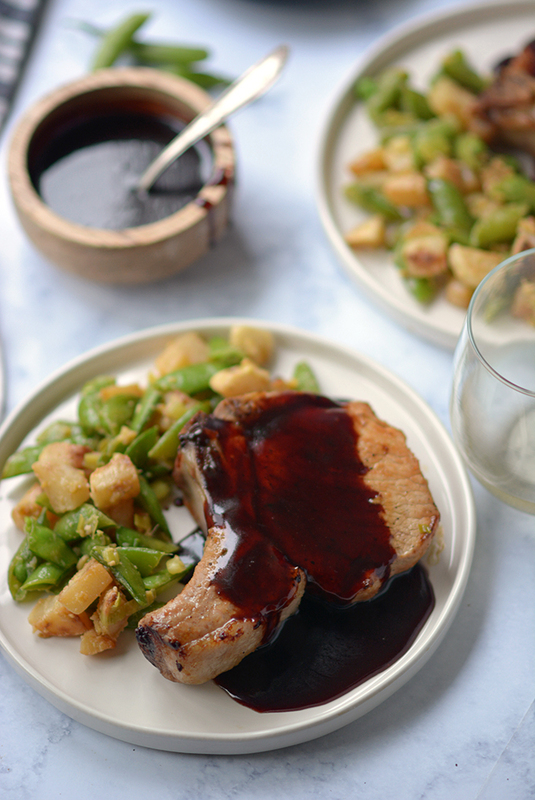 The sauce is poured over a savory and tender pork chop. The two are paired with Asian flavors like rice vinegar, mirin, and hoisin sauce. 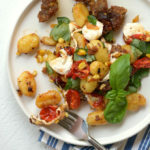 The result is a succulent, sweet and savory entree. 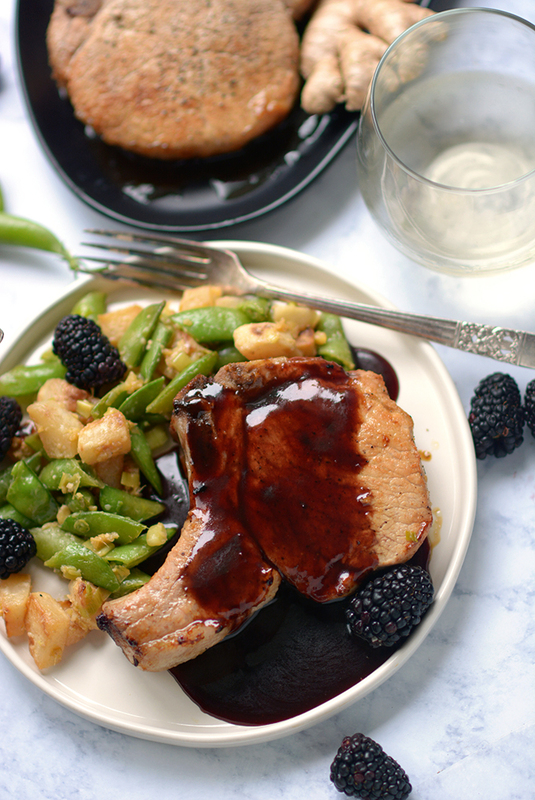 If you’re looking for a tasty side to serve with these blackberry chops, they pair perfectly with my recipe for Ginger Miso Turnips and Sugar Snap Peas. 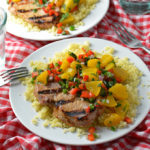 You’ll see it pictured alongside the pork chops throughout this blog post. I think you’re going to love the two paired together as a tasty dinner that celebrates blackberry season! All I can say is, thank goodness for my mother-in-law for saving me and this blog from a sad, blackberry-less existence! Do you tend to shy away from blackberries due to their texture? Shy away no more! This sweet & savory recipe captures all the wonderful flavor with no pesky seeds! In a ziplock bag mix together the dark brown sugar, salt, rice vinegar, and water. Brine the pork chops in the sweet and salty mixture for 2-4 hours in the refrigerator. Take the chops out of the refrigerator 30 minutes before cooking so that they can come to room temperature. Preheat oven to 400ºF. Remove the pork chops from the brine and pat dry. Rub each side of the pork chops with olive oil and black pepper to taste. 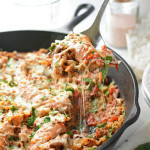 Cook in a cast iron skillet or other oven-safe pan. On the stove top sear the pork chops on each side over medium-high heat until they are golden-brown. About 3 minutes on each side. Carefully transfer the pork chops to the oven and roast for 6-10 minutes or until the chops reach an internal temperature of 140-145ºF. 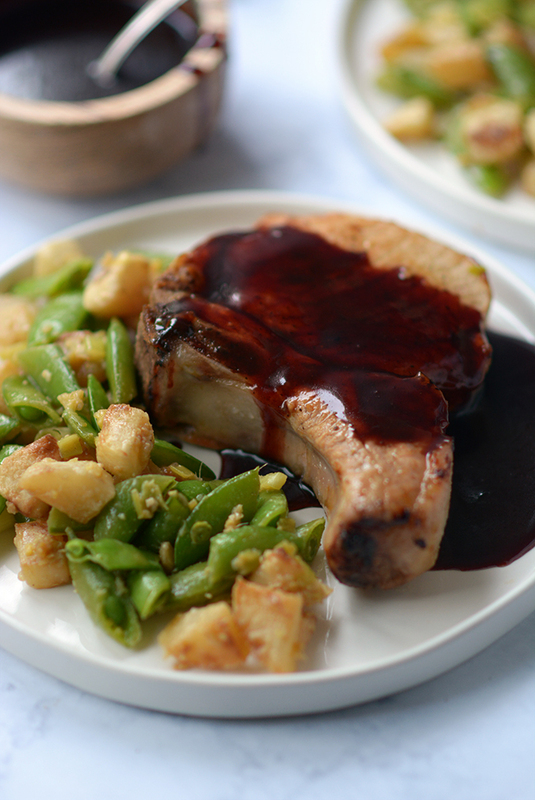 Transfer the chops to a plate and allow them to rest uncovered while you make your blackberry sauce. 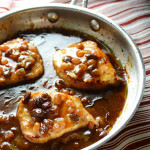 Return the skillet to the stove without cleaning as the fonds will add flavor to your sauce. 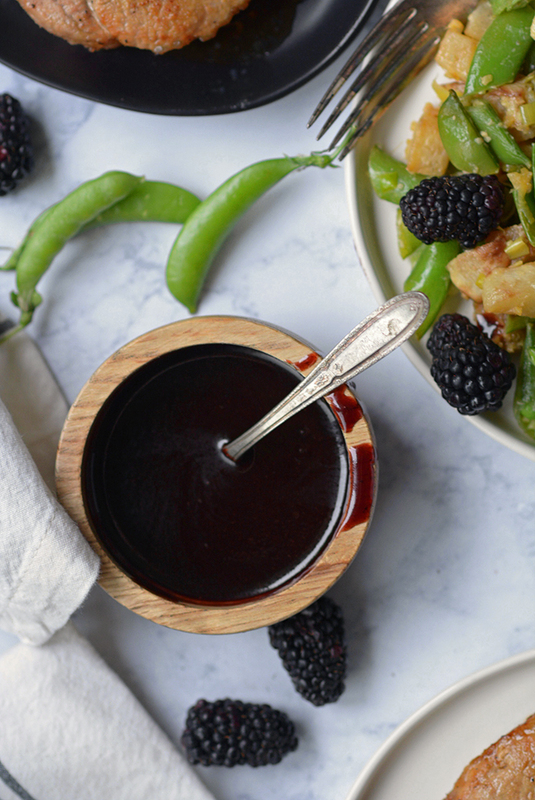 In a small bowl whisk together blackberry jam, hoisin sauce, rice vinegar and mirin. 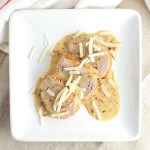 In the skillet you used for your pork chops, melt 1 Tbsp of butter over medium heat. Add the blackberry jam mixture to the pan and bring to a simmer. Cook until the sauce is reduce by half. 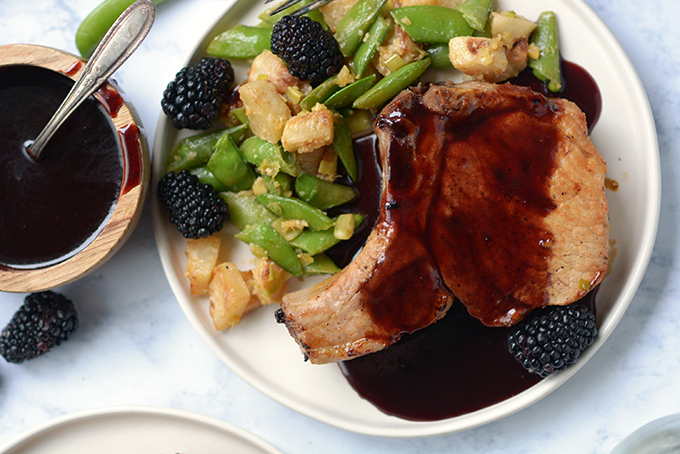 To serve, drizzle the blackberry sauce over the pork and garnish with fresh blackberries. 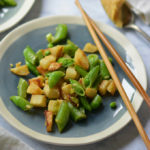 This recipe is pictured with my recipe for Ginger Miso Turnips and Sugar Snap Peas. 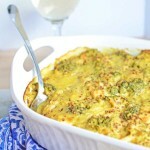 To get the recipe click the link below this recipe card.